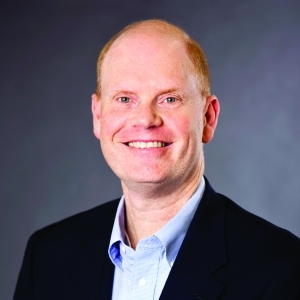 Case is executive director of the Oregon Rural Electric Cooperative Association. He recently talked about what the history of electric co-ops means for co-op member-owners everywhere. Q: How did you end up writing about electric co-ops in the Vietnam War? A: It came out of my first book and the chapter on President Lyndon Johnson. In 1965, he received a letter from the general manager of the National Rural Electric Cooperative Association, Clyde Ellis, saying that NRECA could help win the war by putting electric co-ops in Vietnam. I was intrigued by that bold claim. Since Johnson was such an early and strong supporter of rural electrification in Texas, he embraced Ellis’s proposal fully. Learning about that story led me on this quest to track down some of the men and women who had worked on it. Q: Did NRECA start co-ops in Vietnam? A: It was a really good effort. Just 20 men went over there in a five-year period. These were the most difficult co-ops to establish in the history of the electric co-op program. The Viet Cong soldiers that were fighting against the South Vietnamese tried to cut down the co-op lines and chop down their poles and blow up their dams, and they did all those things. The people trying to start the co-ops faced rampant corruption and an inability to get poles and other materials. They got three co-ops up and running and brought light to thousands of villagers. But the program ended and they had to leave, and the communists overtook the country. Q: What lessons did you learn from researching the book? A: The support the U.S. co-op workers got from the Vietnamese villagers was not unlike the support from the farmers who started electric co-ops in the United States in the 1930s. The Vietnamese villagers wanted a radio. They wanted an iron and lights to read. Toward the end of the war when the communists were rolling through the country in 1975, they came to a town that was one of the co-ops’ headquarters. The militia in the town rose up and fought against the communists in one of the most heroic battles of the war. They were fighting for their electricity. They were fighting for what they had built. Q: Has researching these books changed your view of electric co-ops? A: I have a greater appreciation. Our heritage is so much a part of who we are, and there’s not many people who remember when the lights came on anymore, so that’s different. But the core values of what co-ops do are the same as in 1936 when the Rural Electrification Act became law. Q: What are those values? A: I think of one particular co-op, about medium-sized and close to an urban area. It has several thousand people who come to the office to pay their bills. They don’t need to do that. It’s a lot easier to just toss the bill in the mail or pay online, but they go in because the co-op has this value beyond just electric service. It really is the center of everything in the town and an economic driver. That sums up how the co-op is not just a power company. It’s the center of their world. Q: Does that kind of relationship really apply in this increasingly high-tech world in a high-tech industry? A: As I travel the country, I’m blown away by the technical acumen and the vision and the strategic abilities of co-op leaders to see into the future. Electric co-ops are getting involved in providing broadband internet connections at a time when nobody else will do it. It’s the same innovation that brought electricity to rural areas. Q: Can a co-op be successful providing technologies as different as electricity and broadband? A: Co-ops will embrace new technologies when that’s what their members want. Members say they’re interested in solar energy and other utility innovations, like developing advanced batteries that could increase reliability and store renewable energy for times when the sun isn’t shining or the wind isn’t blowing. Co-ops never strayed from that business model that listens and responds to their members, their customers, their owners. Q: Can’t some of these new ventures be risky? A: Definitely. And that brings out another strength of member ownership: The control is local. Providing internet and other services won’t make sense for all of the more than 900 co-ops across the country. There are very difficult decisions being made in co-op boardrooms, and history shows there is tremendous wisdom that comes out of the discussions among the local co-ops and their members. Q: How does that member-owned business model relate to the basic mission of keeping electricity reliable and affordable? A: Co-ops continue to be very competitive, in rates, service and reliability. And there are so many other things they do for their members. It comes back to that local connection. Members know the folks who work at the co-op. They know the directors. There’s terrific customer service getting the lights back on after an outage. Electric reliability is very important, and co-ops do that as well as anyone. Q: One characteristic of electric co-ops is their not-for-profit nature. How does that affect the co-op members? A: A lot. Increasingly, institutions have fallen from grace because everybody believes there’s this profit motive that’s just out to milk you and there’s such a lack of trust in a lot of the large institutions. Being not-for-profit is an attractive feature that means decisions are based on the best interest of the co-op and the consumer. Q: So what should members know about their electric co-op? A: That they have the ability to influence their co-op more than they ever imagined. Co-op board members that I know are really interested in hearing from folks and getting feedback. One person can really make a huge difference. When somebody shows up at a co-op annual meeting and has a point to make, the boards take it seriously. The co-op’s management takes it seriously. That’s the value. It’s pretty hard to get heard these days. But at a co-op, your voice makes a difference. During one of the hardest chapters in American history, electric co-ops volunteered to win the war in Vietnam. 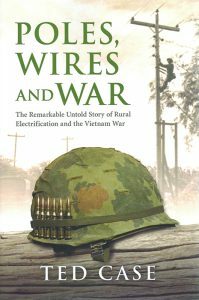 They didn’t win the war, but in his new book Poles, Wires and War, The Remarkable Untold Story of Rural Electrification and the Vietnam War, author Ted Case tells a riveting story of how they tried. He argues that the success electric co-ops had in the conflict that divided our nation just might have helped that Southeast Asian nation recover more quickly by demonstrating the value of bringing electricity to the countryside. Case brings authority to the book as executive director of the Oregon Rural Electric Cooperative Association. He also makes good use of his masters degree in fiction writing to tell a compelling story of an audacious offer from Clyde Ellis, the head of the National Rural Electric Cooperative Association, to President Lyndon Johnson. Give the South Vietnamese electricity, Ellis said, and you’ll win their hearts and minds in the fight against communism. What followed was a classic battle of enormous personalities, foreign and domestic political and military maneuvering, and a determined band of people who brought electricity to the American countryside, fighting the odds to bring light to a warzone halfway around the world. Case creates a fast-paced narrative as the crews race the collapsing war to pass bylaws, organize the co-ops and tangle with corruption, bureaucracy, in-fighting and Viet Cong soldiers determined to destroy what they were creating. In the end, in less than four years, three electric co-ops were bringing electricity to more than 8,000 members. It was a service the South Vietnamese villagers valued and owned. They even felt strong enough to literally fight for it, in a doomed battle against an assault from Viet Cong armored tanks. Case creates a highly readable, deep and unique American history of overcoming the highest of hurdles to show people how they could bring power to themselves; first in America, and then to the world. You can order the book online at TedCaseAuthor.com.